Last year, at the Southern Foodways Alliance Symposium in Oxford, Mississippi, I was sitting at lunch with Christopher Kostow when chef Ashley Christensen knocked our socks off with an unforgettable parade wonderful vegetable dishes: jars of field peas, poblano peppers stuffed with kuri squash, and a gorgeous smoked tomato pie with a healthy dollop of velvety whipped cream infused with corn. 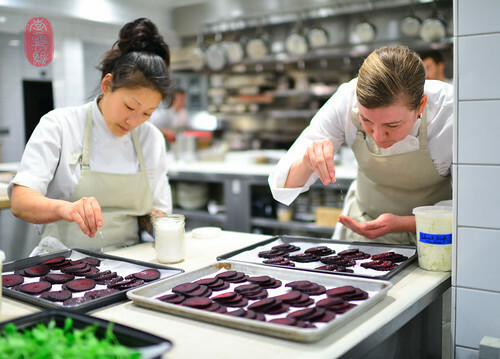 Since, I’ve had the pleasure of seeing Christensen at a few events around the country, and eating more of her food, including at her restaurants Poole’s Diner, Joule, and Beasley’s Chicken + Honey in Raleigh, North Carolina. And I’ve come to appreciate her thoughtful, and deeply soulful approach to regional cookery, especially with vegetables. 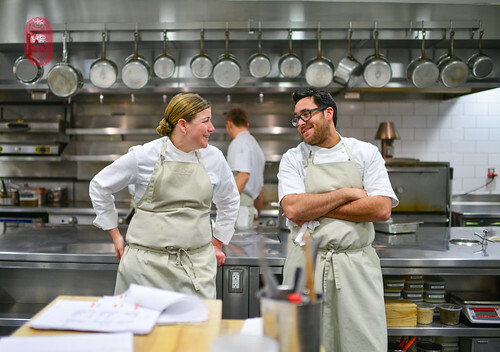 So, I was particularly excited that Kostow invited Ashley Christensen to participate in this year’s Twelve Days of Christmas at the Restaurant at Meadowood. Ashley Christensen’s pimento cheese is great. She brought a bucket of it to a house party at the Music To Your Mouth Festival a few years ago, and the lot of us stood around spreading it on everything in sight, including – when we had run out of all else – my friend Sarah Trapp’s mother’s almond-flavored pound cake. That’s how great it is. She served her pimento cheese last night on crackers as a canapé, along with “Oysters Rock-A-Billy” – her take on oysters Rockefeller, replacing the bacon bits with crunchy cheddar cornmeal crumbs – and deviled eggs, which she served in vintage deviled egg plates (Who know such a thing existed? I’m kind of obsessed now.). Christensen loves field peas. In fact, she has three extra freezers in her house devoted to putting up her favorite White Acre peas. She brought bags of them to the Twelve Days of Christmas and warmed them up with diced Covington sweet potatoes (a varietal that was developed at North Carolina State University’s College of Agriculture and Life Sciences) as an accompaniment to three cuts of lamb (leg, neck, and rib meat from Craig Rogers’s Border Springs Farm and Will Harris’s White Oak Pastures). Deeply soulful, this was, perhaps, my favorite dish of the night. For one of his dishes, Kostow wrapped strips of sturgeon filets (these sturgeon, the size of me, are from Passamore Ranch in nearby Sacramento) in collard greens. He buried the wrapped fish in hot embers and baked it until just under-cooked. Unwrapping the sturgeon, the filets were seared and finished in a pan and then served on creamy samp grits with diced ham hocks and potlikker, thickened with kudzu. I’ve had coal-roasted fish wrapped in cabbage at The Restaurant at Meadowood, and this collard-wrapped version was a great example of how Kostow transposes his style of cooking to another, borrowing ingredients having a different identity and regional association from his own. My favorite dish from Kostow’s team last night was the cheese course. They served Sweet Grass Dairy cheese (from Thomasville, Georgia), whipped with butter, with pão de queijo – a slightly mastic Brazilian bread roll made with tapioca starch (traditionally, sometimes made with cassava starch) – and a nugget of honeycomb. It was Kostow’s version of “biscuits and butter.” And it was fantastic. 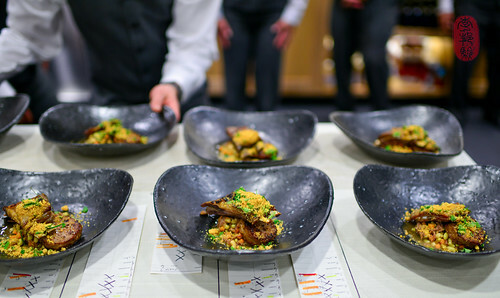 The entire menu from Ashley Christensen’s dinner, with wine pairings by the guest vintner Constant, Diamond Mountain Vineyard, is below, along with a slideshow from the fifth day of Christmas at The Restaurant at Meadowood. If you would like to see the photos in a larger size, click through the slideshow to the Flickr album. Glacier Bay oysters, cheddar cornbread croutons. Lobster, gelée, lobster mushrooms oil. White acre peas and Covington sweet potatoes. Photos: Deviled eggs in vintage deviled egg plates; Katianna Weiner and Ashley Christensen seasoning beets; lamb cassoulet with white acre peas and Covington sweet potatoes; and Ashley Christensen and Christopher Kostow. ~ by ulterior epicure on December 13, 2013. Before there was the “Winter White House” at Mar-a-Lago, my fellow Kansas Citian Harry S. Truman established the “Little White House” in #KeyWest, still an active presidential accommodation to this day.